Our most popular webinars, as chosen by viewers like you. We produce dozens of webinars every year. These quickly became customer favorites. Level up your social media game. You know your efforts on social media are valuable to the organization—and you’re ready to prove it. But attributing success directly to social activity can be complicated. 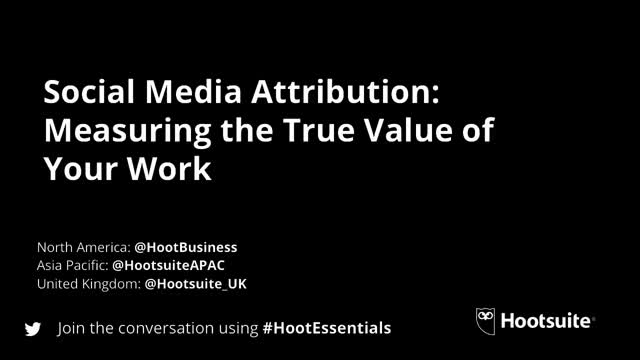 Join us for this webinar with industry experts and social media pros from real businesses as they share stories, insights, and advice about successful social media attribution. What makes Hootsuite Enterprise a market leader? Hootsuite was named a leader in enterprise social media management solutions by Forrester. Their analysis showed that organizations need a solution that helps them with three key challenges. Is your social media strategy focusing on the three right areas? Looking ahead to 2018, we've identified three key trends that enterprise organizations need to adapt to. Watch this exclusive webinar featuring Forrester analyst Erna Alfred Liousas, one of the authors of The Forrester Wave™: Social Media Management Solutions, Q2 2017. Jeremy Wood, Hootsuite’s vice president of product marketing, will bring these key trends to life with examples of how three of our customers are using these strategies already to add value across their customer life cycle.